You may not recognise her voice, but Heidi Murphy is the driving force behind one of Australia’s most successful radio shows. Heidi Murphy’s radio career has taken her across a fair chunk of the country over the last twenty years. Starting in community radio in Brisbane, before moving through Townsville, the Gold Coast and then to various stations in Melbourne, Murphy has seen it all. Perhaps more fittingly for her role on the airwaves, she’s heard it all. But one thing has remained constant throughout her whole career. “Radio has always been my passion,” Murphy said in a guest lecture to first year students at La Trobe University last week. Now settled at 3AW in Melbourne, she’s spent the past four years as the executive producer to legendary broadcaster Neil Mitchell. As a producer, it is her job to find stories and topics for the show on any given day, source interviews for these topics, and oversee the production of the show as a whole. It’s a role that she says came about almost completely by accident. “It started by fluke really, I’d never thought about being a producer,” she said. From that unexpected offer, a strong working relationship has formed between the two, and Mitchell’s show on 3AW has continued to grow and improve under Murphy’s watch. One of Murphy’s main duties is finding interview talent and sources for stories. She says it can also be her biggest challenge, as some are less willing to help than others. “Our mornings are spent on the phone ringing sources, trying to get people to speak to us who might not necessarily want to speak to us,” she said. While producing for radio was a completely new role for her, Murphy has always had a nose for the news. A three-time Quill Award winner, as judged by the Melbourne Press Club, her ability to track down untold stories is unmatched. She says some of the best topics and ideas can come from surprising sources. “The things you can find on Facebook, the things you can find on Twitter, the people you can track down are pretty extraordinary,” she said. While social media can be a blessing for their work at times, it can also be a curse. Public figures often use it as their own personal media outlet, which Murphy says can make it difficult to hold them accountable. “Look at most political announcements these days—there’s a little Facebook message from the premier about it, a little periscope message from the premier about it, they’re very carefully putting out tweets with videos,” she said. While Murphy has always had a passion for radio, she has also branched out into television in recent years. Working as a freelance TV reporter for the Weekend Today show over the past two years has had its challenges, and she says the extra job has affirmed her love for radio. “I’m not TV-trained, it wasn’t my first love… I find it a little bit less satisfying, because you’re out at the one place telling the same story several times hour to hour,” she said. Despite this, she says there are some positives that set it apart from her day job in the studio. “The thing I like most about it is that I’m back out on the road and doing stories, not stuck behind the glass relying on the phone,” she said. 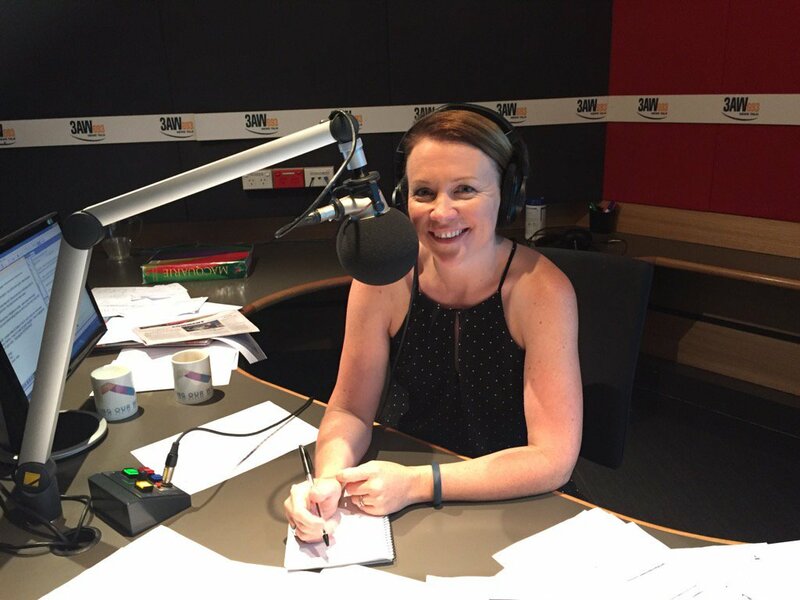 That on-air experience with Weekend Today came in handy earlier this year, as she was called upon to fill in for Mitchell on 3AW’s morning program. She says the experience gave her a new appreciation for Mitchell’s work hosting the show. “It’s terrifying, I did a week in summer… three and a half hours of live radio is intense,” she said. Working alongside Mitchell, an iconic figure in Australian broadcasting, has been eye-opening for Murphy. After almost 50 years working in the media, she says he’s showing no signs of slowing down. “He is tireless—you would think every story under the sun he’s heard it or told it, but every single day he comes in with passion for something,” she said. Murphy is quietly building a resume that could one day be held in the same regard as Mitchell, and she has no intention of leaving the industry any time soon. That is, as long as the industry can last with her. “I don’t think I’ll ever get out of radio in some way, shape or form, so fingers crossed it’s an industry that hangs on for a lot longer,” she said.